I rock the textile arts. I’ve got a degree in Fashion Design, and have done a lot of sewing and sewing related work like fabric store retail, sweat shop garment worker, sewing instructor, custom dressmaker, and maker of ridiculously intricate and expensive dresses for dolls. I draft sewing patterns, I knit, embroider, crochet, smock, quilt, and have forgotten more about textile science than most people I meet have ever heard of. Or, I should say that I have done and know how to do these things. These days it’s mostly writing with some knitting on the side. Carrie Ryan’s Forest of Hands and Teeth, The Complete Idiot’s Guide to Zen Living, Kristen Lamb’s Are You There, Blog, It’s Me, Writer, Malcolm Gladwell’s The Tipping Point, and lots of DC comics from their Flashpoint thing. Pop culture. So much. I love to learn, but I have a hard time finding non-fiction I can read. When it feels like the author cares more about impressing colleagues than sharing information, it just starts to feel like work. Which is why I started going for Idiot’s Guides when I want to know something. Breaking Benjamin is my biggest muse right now and has been for a while. I love the sound and the lyrics really speak to me in characters and scenes. Evanescence and Metallica also appear on my playlist a lot, as well as Led Zepplin, a-ha (yes, a-ha), Seether, Sarah McLachlan... I love music that sets a mood and has lyrics that tell me a story. And if that story’s painful and kind of angry about it, all the better! Yes. That is, I plot out and outline my stories before I sit down to write, but there are always surprises. I have a vacation analogy. Some people will rent a car, drive off into the countryside without a plan, and just see what they see. But I’m more the kind who has specific points of interest that are must-see locations. I don’t have a down-to-the-minute itinerary, though. Within the plan there’s room to explore, check out this local attraction or that side-road. And if the side-road turns out to be more compelling than one of my “must-see” spots, I’m free to change course. But I don’t want to spend my whole vacation wandering around without a map. 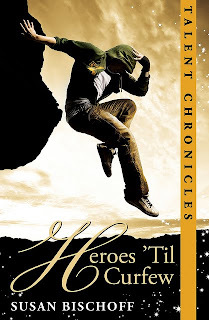 The Talent Chronicles series began with my desire for more superheroes! More romance! More Superhero! Romance. I’ve just released the second novel in the series, Heroes ’Til Curfew. Check with your favorite retailer, or visit my website: http://susan-bischoff.com for more information. Joss Whedon and Breaking Benjamin--you're my kind of girl!! Your covers are awesome and I love the idea of Superhero Romance. I look forward to The Talent Chronicles.